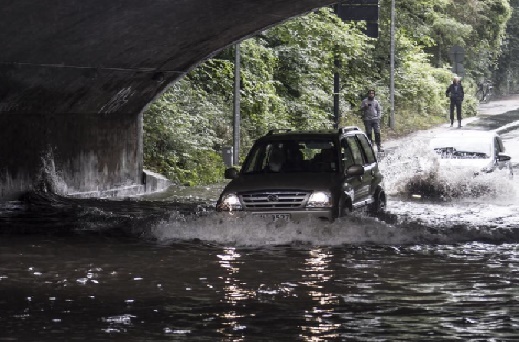 Motorists who regularly use Lyngbyvej, one of the major transport arteries into Copenhagen, must dread the words ‘cloudburst’ in a weather forecast. Last Sunday was no exception; as well as causing the half-marathon being run in central Copenhagen to be cancelled in mid-run, several stretches of the road were completely impassible due to massive amounts of water. However, according to the Greater Copenhagen utility company HOFOR, there is no immediate solution in sight. In fact, HOFOR claims that nothing can really be done before 2026, reports Ingeniøren. It is only then that the new drainage systems will be in place that can keep the road dry. This is not good enough, says Niels Tørslev, traffic director at the Danish road directorate Vejdirektoratet. There are a number of reasons why the motorway flooding takes place. One of them is that when the sewage pipes from Emdrup lake are flooded during a cloudburst, water begins to rush to the surface and down into the lowest point on Helsingør motorway – there where the S-train crosses both the motorway and Lyngbyvej. To deal with this, two pumps have been installed, but during a cloudburst, the main sewer becomes filled beyond its capacity so the pumps are unable to divert the water away through it. Already back in 2014, Copenhagen municipality decided that HOFOR should be allocated 12 million kroner for a project to divert the water away from Emdrup lake across the road into a holding reservoir in Ryparken. The project should have been completed in 2016 but has been delayed because shafts had to be bored for a tunnel in Ryparken that would create extra capacity in the sewers in the event of a cloudburst. The tunnel will only be ready in 2025, when construction of the reservoir can then begin. Jes Clauson-Kaas, a consultant for HOFOR, says that one of the reasons for Sunday’s flooding is that the pipes to lead the water away from Lyngbyvej are under-sized. “The system on Lyngbyvej is just not designed to deal with that amount of water, so the road directorate has a problem. They will have to redesign the system to cope with large amounts of water in the same way as we have done with the so-called storm drains in the inner city,” said Clauson-Kaas. Niels Tørslev disputes this and claims that the problem lies in the fact that the water is not being diverted away from the roads because the sewage system becomes overfilled. A meeting has been set up between engineers from both HOFOR and Vejdirektoratet in order to re-examine the timetable for remedying the situation.